OMG can we really be half way through the year already? People are soon going to start mentioning the C word at this rate! On the positive side its almost time for Summer Holidays. I definitely need to get some Spanish Sunshine as the UK weather seems to think we are still in the middle of winter! Anyway, enough with the weather chat, time for a rundown of all the #foodieparcelsinthepost that Mr Postman and assorted delivery drivers have brought me in the last month. Lets start with what has to be the most amazing organic beef that I have ever tasted. Silverside from The Hebridean Food Company. I roasted this with no additional flavours or seasoning and the taste was absolutely incredible. The beef is from Highland Cattle (the hairy ones with the horns) that are traditionally raised on an uninhabited island in the Scottish Hebridies. For 8 months of the year they graze on machair grasslands and shoreline seaweeds before they are moved inland to the sparse heather hills. The cattle are reared for 3 years, longer than industry standard and the resulting beef is dry-aged on the hook for 3-4 weeks. 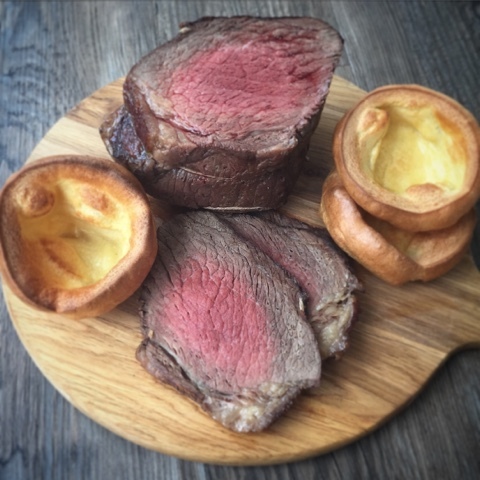 The company founded in 2014 by 24 year old Douglas Stewart, son of a lobster fisherman recently launched its range of organic beef and lamb which is available online alongside the existing range of Hebridean seafood products. Orders are shipped to the whole of the UK by dedicated 24hr courier to ensure freshness. The Fabulous Bakers boys have grown up and are now The Fabulous Bakers. 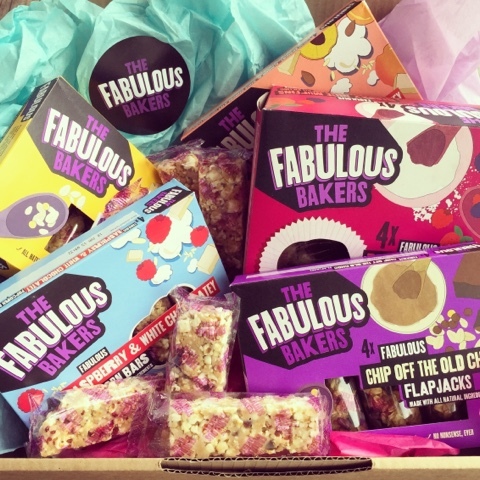 A new name and a new ethos baking fabulous cakes, muffins, flapjacks and bars using only natural, honest ingredients and no artificial nonsense ever. Sounds like a winning formula to me, but is the taste still there? I was sent a selection comprising of Popcorn Bars, Berry Nice Muffins and Golden Oaty and Chip off the Old Block flapjacks. I'm a huge popcorn fan so wasted no time in trying an Apricot, Almond and White Chocolatey Popcorn Bar. Unfortunately I'm not much of a white chocolate fan and it was too sickly sweet for me and the popcorn was chewy rather than crunchy. I reckon Popcorn with milk or dark chocolate would be more my thing. The flapjacks were fab and as with all the products were individually wrapped which made them great for my kids to enjoy as break time snacks and in packed lunches. Full moon, half moon, total eclipse. I can't eat a Jaffa Cake without thinking of the iconic advert. Could the cakes with the smashing orangey bit possibly get any better? A wee bit of personalisation wins me over every time. 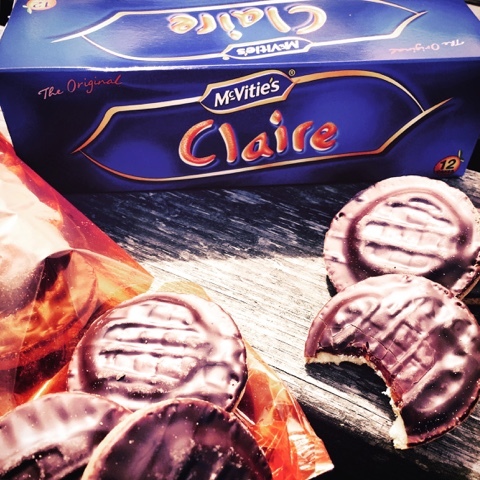 Check out the online McVities Sweeet Shop where you can choose from over 500,000 names, nicknames and popular greetings. A little tarsier told me that mugs and greeting cards will also be available soon. Personalised packs cost £2.49 each plus P&P of £2.50 per order. Be warned however that having your name on the outside doesn't necessarily mean you get all the contents. I only got two from the dozen. Life is so unfair. Hands up if you genuinely manage to eat your five a day. I must admit that I don't always make the magic number. 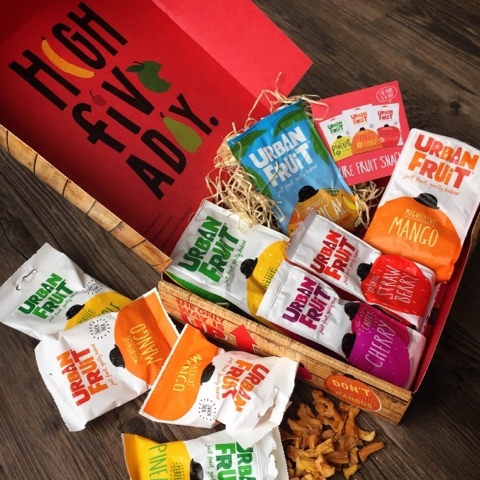 Urban Fruit have developed a range of tasty treats that can help you on the way to target. There's no funny business, just pure gently baked fruit with no added sugar, oils, sulphites or concentrates. Perfect to munch on the move. My absolute favourite was the Tremendously Tropical bag which contains mango, pineapple, bananas and coconut. I've just read the PR blurb which says it comes in a larger bag so is perfect for sharing. Whoops. I managed it pretty sharpish all on my own. Of the individual fruits the Pineapple got my vote whilst Girl couldn't get enough of the Mango. The Cherries and Strawberries didn't float my boat but with 8 varieties there's sure to be one to suit all fruity tastes. I've had this knife for less than a week but I absolutely love it. 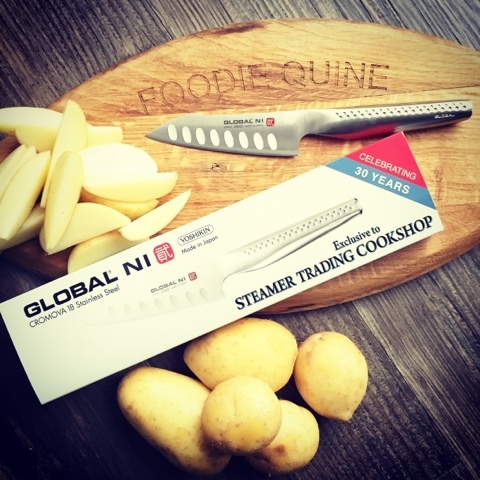 It's new and exclusive to Steamer Trading Cookshop and is from the prestigious market leading Global Knives UK. 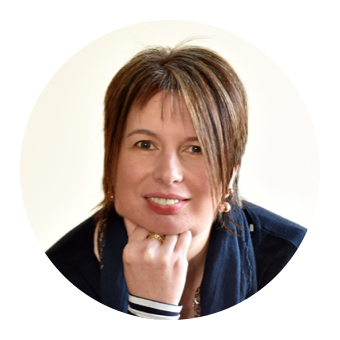 Steamer Trading are a 30 year old family owned business with 34 stores throughout the UK in addition to their online shop. They pride themselves on their wide range of expert cookware and staff who know their Santoku’s from their Sashimi knives. The Global Ni is the first new consumer range to come from Global in over 30 years, taking all the qualities from the original series and making them a little bit better. Heavier steel, thicker blade and a stronger bond between blade and handle. I found the Cooks Knife to be super sharp and unbelievably comfortable to use with great balance. It has a really distinctive and sleek look with its iconic Japanese styling. It's the first one piece knife that I've owned and I'm definitely converted. Prices are from £59.99 with an introductory half price offer on the 11cm Cooks Knife (fluted). My kids eyes lit up as I unwrapped the parcel from The Treat Kitchen. This small, family run, confectionery business has shops in Nottingham and Leicester as well as an online store. Their USP is the clear packaging which allow the brightly coloured treats to shine. 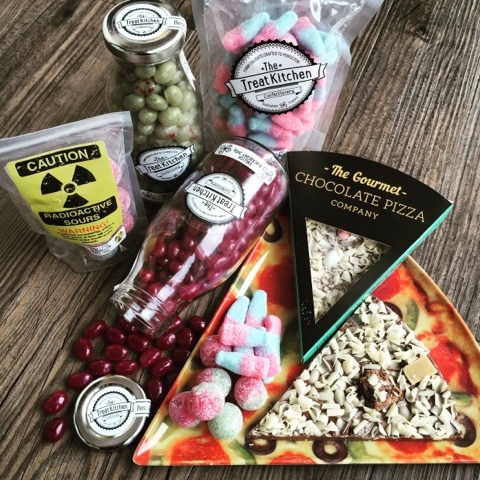 We received a selection of their best sellers - Gourmet Jelly Beans, Radioactive Sours, Sweetshop Heros and Gourmet Chocolate Pizza. Love the packaging for the jelly beans and will definitely be reusing the wee milk bottles. Short work was made of the pizza by my chocoholic daughter and her face was a picture when she tried the radioactive sours. The sourness is unbelievably intense for the first 30 seconds or so. She had great fun challenging her friends to eat one in the playground. 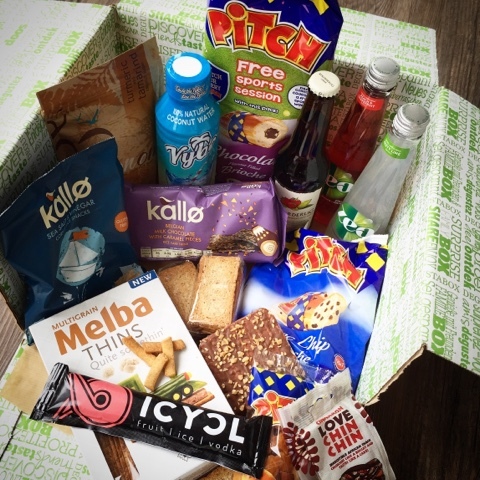 If you fancy trying out some old sweetshop classics, traditional rock, pizza with a twist or one of the 36 varieties of jelly bean you can used code FOODIE10 for a 10% discount at The Treat Kitchen. I'm a long time fan of Mackays range of preserves and have developed a couple of recipes for them, namely Bucks Fizz Breakfast Muffins and Marmalade Flapjacks. It was great to catch up with their Marketing Co-ordinator Claire at the Royal Highland Show and see their newly launched range of a dozen savoury products. I used both their Chilli Jam and Red Onion Marmalade in the Scottish Salmon Canapes I was making at the show and they went down a treat as tasters. Back home I've been trying out some more of the range. 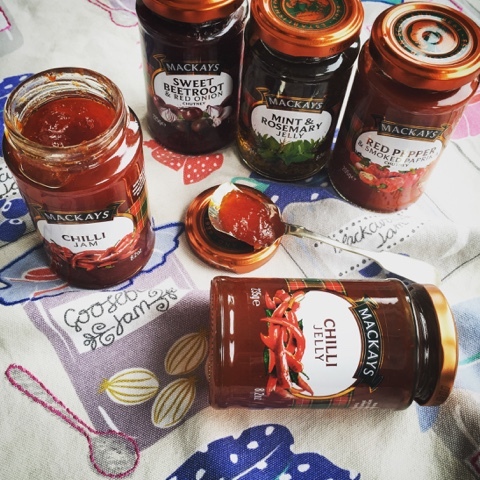 The chilli jam and jelly both work so well with cheese and give a nice kick to a toastie. The chutneys are all great flavour combinations, just a wee bit different from the norm and I can't wait to cook up a leg of lamb for a Sunday roast so I can try out the Mint & Rosemary Jelly. Is it really possible to get excited about inanimate objects like kitchen utensils? It is if they are from Oxo Good Grips. I've always had vegetable peelers with swivel blades, I just don't get on with fixed blade ones. Bad experiences with them in Home Economics lessons in the 80's. I've gone cheap and cheerful in the past but they really don't last. 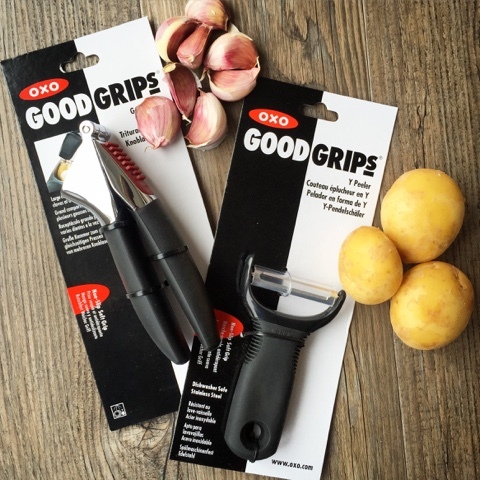 The Good Grips Y Peeler does the job perfectly. Easy to use, comfortable to hold and a super sharp blade. However its the garlic peeler that I'm truly smitten with. It's the best one I've ever used. Heavy duty, works on unpeeled cloves with just one squeeze and has a built in hole cleaner that actually works. You flip the handles back on themselves and it pushes out the leftovers. Both items are dishwasher safe and when I posted about them on Facebook other users shared stories about how long they lasted so I'm optimistic on that count too. The last parcel in this months roundup is a bit of a teaser for a full review post to follow. 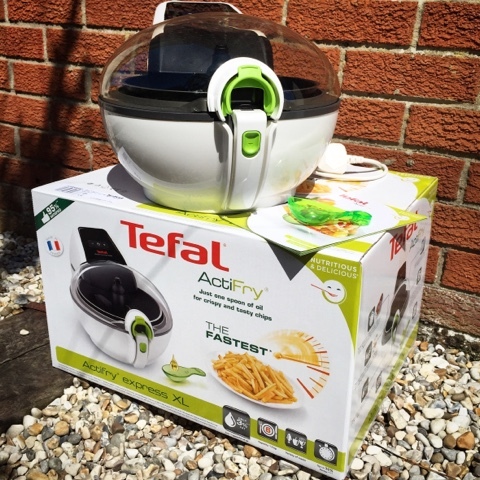 I've always been intrigued by the concept of a Tefal ActiFry but though you could only use it for cooking chips and as such it wouldn't really be worth either the money or the worktop space. We've had it for a few weeks now and I'm still in the experimentation phase but as well as cooking up chips, potato wedges and sweet potato wedges I've also used it to cook chicken tikka, all using just a spoonful of oil. Watch this space for the results of my participation in the Actifryday Challenge with the Actifry Express XL. 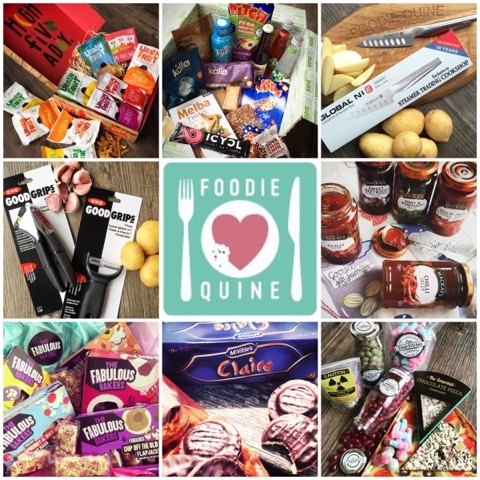 Disclosure : Thanks to The Hebridean Food Company, The Fabulous Bakers, McVities, Urban Fruit, Steamer Trading Cookshop, The Treat Kitchen, MacKays, Degustabox, Oxo and Tefal for providing the above products. I was not obliged to review positively in return. All views expressed are my own. This is not a paid post. That is an absolute travesty! Looking forward to seeing everything you do with the Actifry. We have had ours a couple of years, and absolutely love it - however its seldom I make anything other than chips or roast veggies! Ooooh Roast Veggies, hadn't even considered that. So much experimentation still to do. Wow, what a lot of stuff you've had to try! hope you've got room for it all in your kitchen! Most of it has already been eaten and I'll definitely make room for my new knife, peeler, garlic crusher and the ActiFry. The knife is just brilliant. I've not spent all that much on knives in the past but there is such a huge difference in quality with this one that I'm beginning to think its money well spent. I went for the Garlic Press on your recommendation. I'm way too lazy to peel garlic if I can get away with unpeeled! Lots of wonderful parcels there! Love maces myself. Love to try urban fruit! So many lovely new things!!! That knife looks gorgeous! What was your favourite parcel this month?